Have fun with your Halloween guest at this year's Halloweens party by reading each of the guest their fortune. The Witch Fortune Wheel Game is a fun interacting game that will get everyone's attention. 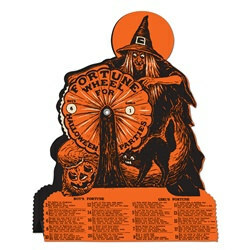 Have fun playing the hostess by taking charge of the Witch Fortune Wheel Game. Have guest gather around you to have their fortune be told. Begin by having a guest spin the wheel on the Witch Fortune Wheel Game. Then the hostess should read the fortune below that matches that number. Halloween is a fun holiday! We also have the Jack-O-Lantern Fortune Wheel Game. A must have for an authentic vintage Halloween party. Great vintage look, loved it! Classic Beistle image, clearly reproduced and good quality.